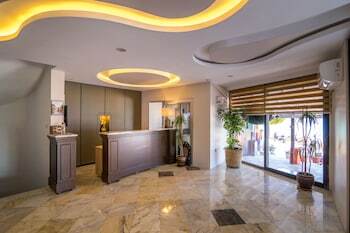 With a stay at Sunday Beach Hotel in Kadınlar Denizi Mahallesi, you'll be on the beach, just steps from Ladies Beach and a 4-minute drive from Kusadasi Castle. Featured amenities include express check-in, complimentary newspapers in the lobby, and dry cleaning/laundry services. A shuttle from the airport to the hotel is provided for a surcharge (available 24 hours), and free self parking is available onsite. With a stay at Taksim International Obakoy Hotel in Alanya, you'll be within a 15-minute drive of Alanya Aquapark and Alanyum Shopping Mall. Free self parking is available onsite.